This blog will aim to break down Tony’s coaching style, his approaches and knowledge to compare them to modern days methods and approaches – Tony’s “cycle racing coaching handbook” was kindly given to us by his son Paul. This document along with the accompanying handwritten notes will be our basis for comparison. To add some structure into the post we’ll break the approach up into four facets; technical, tactical, physical and psychological information. So, grab a coffee and dig in while we project just how far ahead of his time Tony Ryan was! The technical ability is something that’s neglected in the modern-day approach to bike racing and coaching. In my opinion this is a product of the lack of youth cyclists coming up through the club system as was the case in Tony’s day. People are getting into bike racing later with an approach that is more focused on building “FTP” rather than learning how to ride a bunch efficiently. The savings to be made are massive and go a long way to winning you that race! 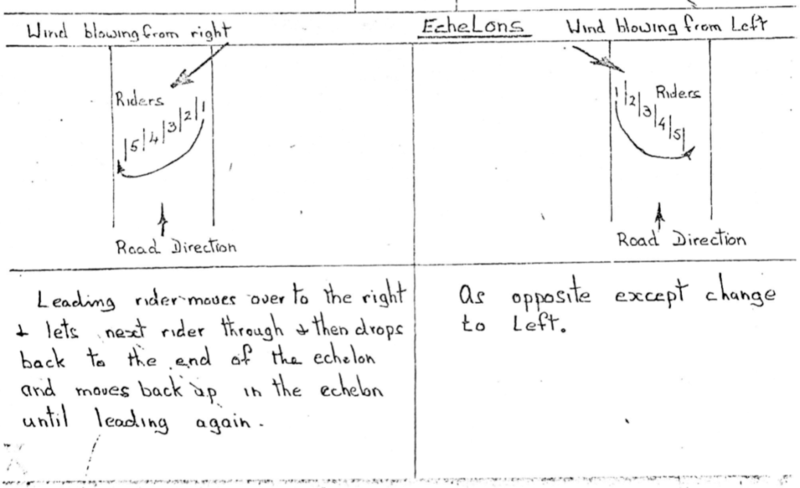 Contained in Tony’s notes, a detailed illustration and accompanying line on how to ride through 90-degree bends, how to ride pacelines and how to ride in echelons. The graphic showing us how to ride in crosswinds (figure 1) explains what to do when wind blows from the right and the left with detailed instruction on how to move through and off in such a formation. You can be sure this was practiced many a morning on the roads of Waterford and Tipperary and quite possibly used to influence many a race! Something that caught my eye was the detailed sub-section on the “finishing-sprint”. Tony states, “no two sprints are ever the same” and how right he is, so often as modern-day coaches we encourage consistency and repeatability. Use a flat road, sprint at max for x seconds etc., Tony suggests you need to learn all the different types of sprints you’re going to encounter in a race; uphill, flat, short-steep and train for these. He states you should always be sprinting against someone and you need to pick a marker and never let up before it. From this, you learn the appropriate gearing, when to launch and “the feeling” of the sprint. The idea of tactics in road racing is daunting to some and to an extent it is something that is learned through and element of trial and error along with a competent technical ability on the bike. From reading Tony’s notes, I believe his approach centered around ensuring you’re physically fit enough and technically proficient enough to be in the right position in the bunch, top 20 in a position where you can observe everything according to Tony. From putting yourself in these positions multiple times and no doubt with face-to-face input and reflection from the coach tactical learning is sure to take place. Essentially this stems back to doing the basics right! The modern coaching approach often looks for reflection through the physical data alone, one thing I aim to achieve with athletes I work with is getting them to provide an account of what happened in the race, good and bad points and what we can work on. Of course, the physical data is excellent to influence training prescription but what is the point if we keep missing the break or messing up that small group sprint? Each phase of training is broken down with specific goals to be achieved within each block. Something that caught my eye was Tony’s approach to winter training. He states too many miles in the cold winter months may not show the results expected. Off the bike training may be more beneficial in the long term. Contrast this to now, a lot of athletes neglect the benefits of cross training both physical and psychological. I think there is often too much of a focus on banging out interval after interval in November. A typical December week for Tony would look like this – Monday: Weights, Tuesday: 30-60 minutes cross training (running, squash, soccer), Wednesday: Weights, Thursday: light cross training, Friday: Lighter Weight Session, Saturday: 3 hours on bike with cadence drills, Sunday: Cyclocross or same as Saturday. This can be seen in figure 2. There is no doubt that an approach such as this creates a better “all-round” athlete but as your level increases I personally think specificity has to also. This cross-training approach should definitely be adopted for months such as October and early November to keep things fresh and interesting! We should state that Tony suggests a more pared back version for youth and junior riders, but the philosophy remains the same. What I really enjoyed reading over this approach was the inclusion of specific strength and conditioning work. Tony gives a program of “serious weight training” for senior and developed (>17yrs) junior riders. This program operates on an alternating upper, lower body system with basic compound lifts moving to more isolated exercises. He highlights the importance of technique and working with a qualified professional. It’s interesting to observe how the attitude to strength training has changed in the endurance domain with a rep range of 10 suggested here, it was a commonly held belief that heavy strength training would add “bulk”. We now know this is not the case and most of our desired endurance adaptations such as increased power at threshold and economy actually happen with lower reps and heavier weights. While saying this it is also important to note how progressive even incorporating gym work was at a time where the commonly held believe was that the cyclist should do only that, cycle. 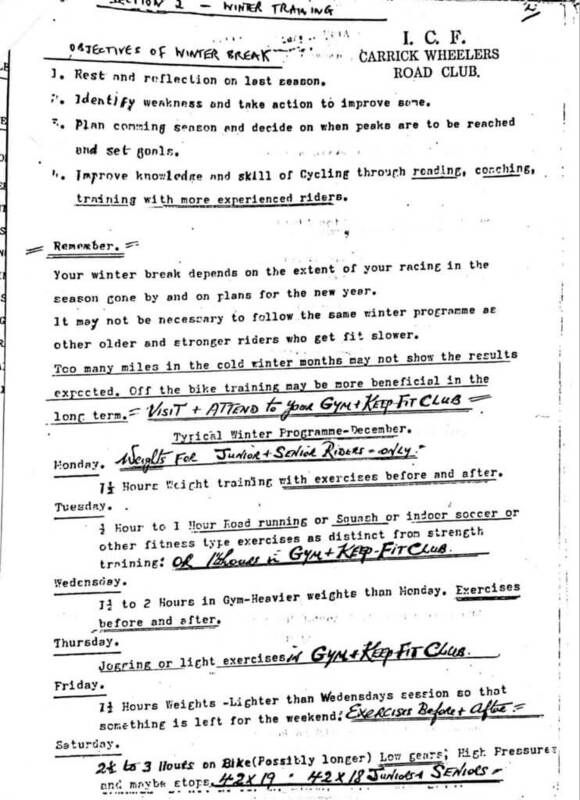 One of my favourite things in the whole series of documents was the “weekly training card”. This was essentially a template of a training diary, see figure 3. Now-a-days we are blessed with technology for monitoring everything from heart rate to power to blood markers. Tony suggests measuring your morning pulse, a technique still used today to measure training response. He also states you need to measure pulse rate after training which is another metric we use known as heart rate recovery. With the absence of power and heart rate monitoring devices on the bike intensity measures include mileage, gearing, course completed, subjective notes etc. While we now use metrics such as TSS, Critical Power, Lactate etc to monitor training a lot can be gained from stepping right back and saying how hard was that ride, was the course demanding and going from there. We should only ever use the metrics to back up and possibly red-flag a needed conversation with the athlete! Figure 3. The Weekly Training Card. “Never, if at all possible, abandon a race. (However sometimes you must be sensible about this)”. We talk about mental toughness and resilience a lot in modern day sport. Tony believed there is always merit to finishing a race. No matter how bad it is going for you there is always something to be learned and built on. Now, we would refer to this as a facet of psychological skills training. 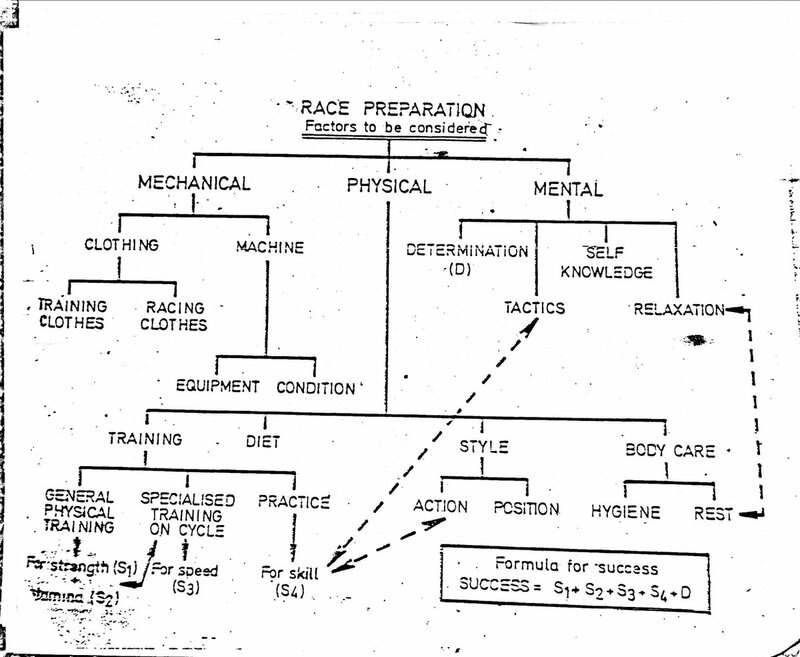 In Tony’s notes this is referred to as “determination” and is included as one of the factors for success in his race preparation diagram (figure 4). Having a balance between racing, training, school, work, family is an important factor in the athlete’s development. Different facets take different priority at various points of the year, this balance in Tony’s opinion is key to ensuring the athlete does not reach a state of overtraining. People, now, could heed this advice – essentially all stress is created equal there is no point pushing the boundaries of your physical capacity in the evening when you have had a hugely stressful day and the goal is adaptation and making you a faster cyclist. Goal setting is also briefly touched on as something which should be done to add structure to your year. Tony suggests doing this in the off-season before putting your plan in place, this is something I’m big on in my personal coaching. He outlines a process which involves reflection on last season, an objective look at your weaknesses and goals set accordingly. With the introduction of power meters and monitoring software there is no excuse not to look back and reflect on your season from a physical standpoint, but it is also important to realise what worked for you, how a better balance can be achieved etc. Always keep a diary of your training and racing and the other matters affecting it. Always have a sensible approach to your cycling and training. Use common sense. Do not become a food fad or a complainer when conditions are bad.